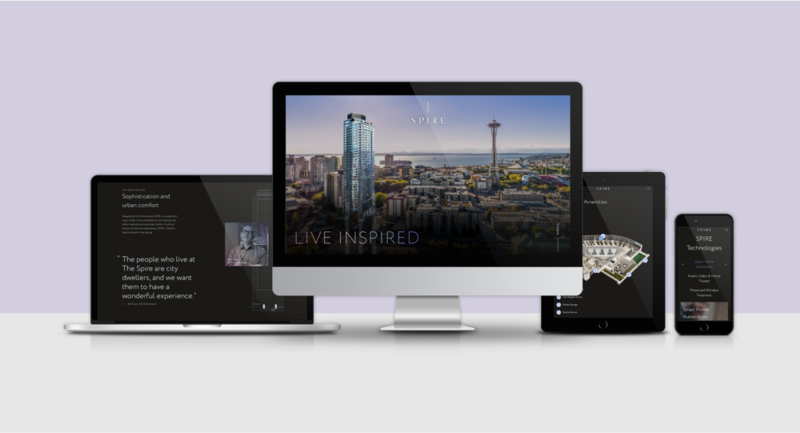 Spire Seattle is one of Seattle’s newest residential development projects in the downtown area. In a city that has prioritised rental developments for the last ten years, Laconia was looking to seize on the demand for homeownership in the city by offering 350+ new condominiums. I led the design of the website and assisted with the interactive touchscreen and iPad application. Despite launching in a hot market, Realogics was concerned about generating interested for presale customers. Our goal was to build a memorable digital identity that was consistent across the entire user experience and give customers the relevant information while still driving them to contact the sales team in person. We were initially provided a rudimentary brand package from the client that we used to inform the digital direction. This identity however did not gel with the customer the project was hoping to attract, nor with the creative vision of the architect and interior designer. The main concept the other design stakeholders had pitched was that of a “prism”, that the building would stand out amongst the Seattle skyline. With that in mind we updated the brand to feature a darker primary palette and introduced the “prism” gradient as a brand element. This was visually memorable and more in line with the story being told by the architect and interior designer. Once we had gotten buy-in from all the project stakeholders we we came up with a system of design that would capture the brand and be applicable across web, mobile and touchscreen. For the presentation experience station we created an iPad App that the sales team could use for projected presentations or more intimate pitches. One of the main selling points of this project that we wanted to make sure users were well informed about was the extensive amenity package. 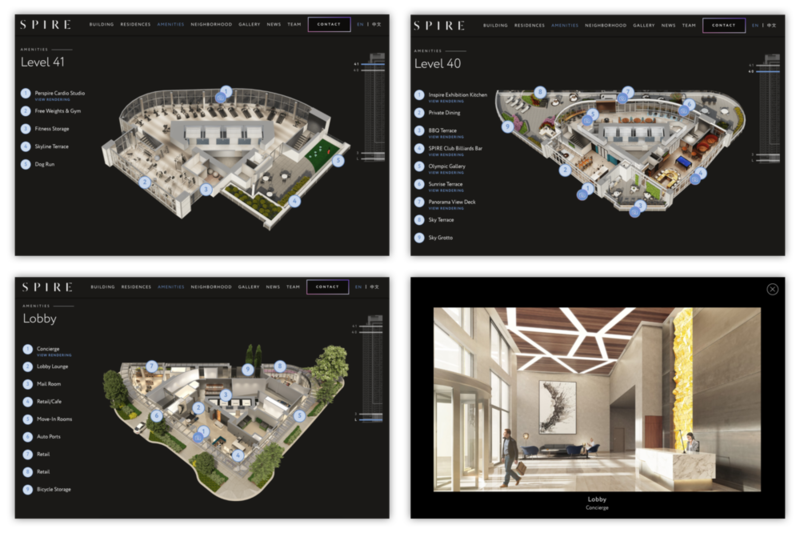 A main pain point experienced by our users was not being able to contextualise the location and scope of amenities within a building. With this goal in mind we worked with our rendering team to create a series of dollhouse renderings that we could use to give the experiences of travelling up the floors with a birds eye view. We also created an interface that allowed users to dive deeper in to some of the features so they could learn more about specific areas that might interest them. Aerial dollhouse renderings were given context by linking them to the architectural wireframe of the building.